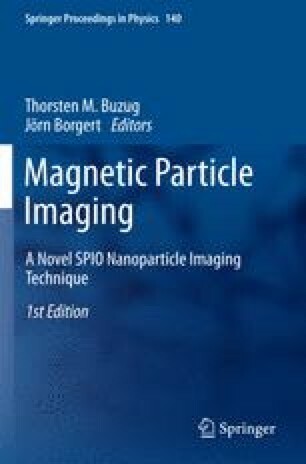 The search for optimal nanoparticlesfor magnetic particle imaging (MPI) has been receiving much attention. Currently, Resovist® an iron oxide nanoparticle-based MR contrast agent is considered as the gold standard for MPS and MPI measurements. In this paper, we evaluate the initial MPS response of iron oxide-based nanoparticle systems with variation in core size and coating. In this context, we synthesized iron oxide nanoparticles with different core sizes (5 and 10 nm) by employing co-preciptiation method. Further, these iron cores were adsorptivelycoated with endogenous fluorophores (flavin analogues: FMN, FAD) to increase their stability and to enhance MR contrast. We have performed initial experiments on these particles in a magnetic particle spectrometer. Their spectrum of higher harmonics was obtained and found to fall off more rapidly than Resovist®. No difference in magnetic behavior was seen between particles with different coatings.